Missing Person: Stephen Tedesco, 55, WM, 5'8", 150 lbs, Last seen on SH 47 Dennis Twp, Cape May, Co. The New Jersey State Police is seeking the public's assistance with locating Stephen Tedesco, 55, of Dennis Township, Cape May County. Mr. Tedesco left a group home in the township and was last seen walking along State Highway 47 on Wednesday, August 23. He is described as 5'8", 150 pounds, greying black hair, with a fair complexion. He is known to frequent Middle Township, Cape May County and may have been seen in Dorchester, Cumberland County on Thursday, August 24. 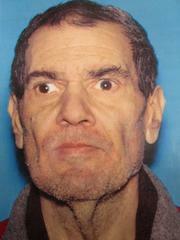 Mr. Tedesco was reported to be exhibiting strange behavior, and detectives believe he may be in danger. Anyone with information is asked to contact NJSP Woodbine Station at 609-861-5698. Anonymous tips are welcome. Anyone with information is asked to contact NJSP Woodbine Station at 609-861-5698. Anonymous tips are welcome.